For some reason, my Secret “Completely Clean” Outlast Antiperspirant has been pretty hard for me to give up. I love the fresh scent and protection I got whether I was working out, running for the bus or just running around my house/office getting life sorted out. Natural deodorant seemed like an awful product best left to people who don’t care if they have body odor. And then one day, something clicked. Why oh why would I want to put something under my arms that contains aluminum and other gross chemical compounds? Especially given that antiperspirants typically don’t wash off that easily, so we are basically layering the stuff over and over again. Another nasty ingredient to avoid? Triclosan. It’s a synthetic “antibacterial” ingredient and the EPA registers it as a pesticide. What?! Watch out – this ingredient might appear in aluminum-free deodorants that are trying to appear healthier. Sneaky sneaky. Grr. List of brands and scents I’ve tried ranked with my thoughts below. 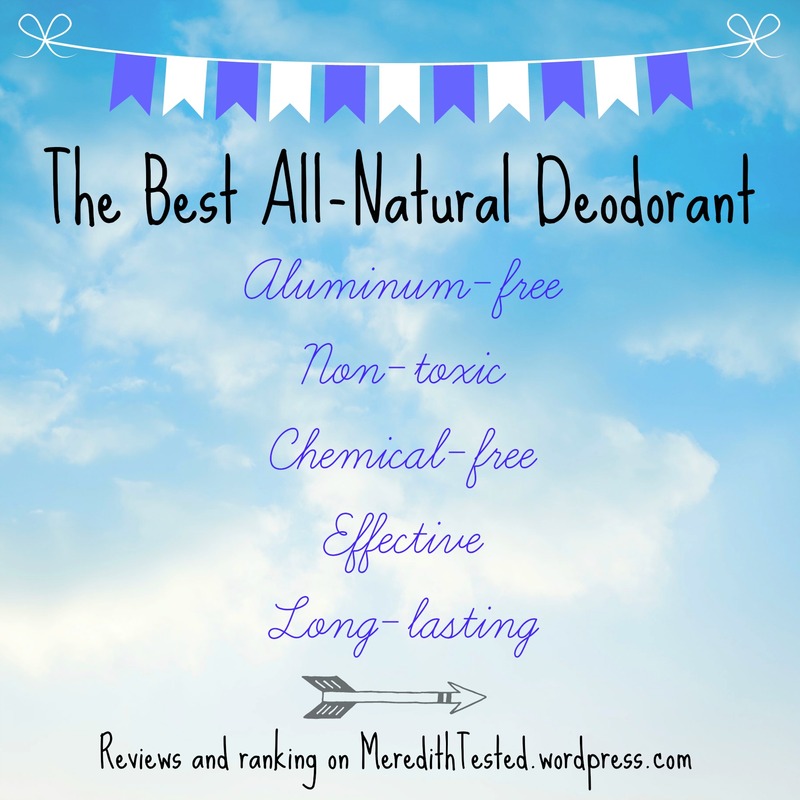 (Note: I’ll update this list as I try new deodorants! Yeah, for realz. Because I love you guys.) Just remember to bring your chosen stick with you to re-apply if you’re particularly anxiety-ridden about your underarms during the day. FYI: So I still stand by the order of these but since my pregnancy my reactions to things and aversion to certain scents has changed considerably. Check out my post on 12/26/15 on current favorites. Update 9/22/16 – I’m pregnant (again!) and I’m loving the Caroline’s Dream Deodorant and Meow Meow Tweet stick deo – both have been working well for me so far. PROs: This brand is certified paleo and only has one deodorant, for good reason. It works really well and has a light scent anyone would like. Baking soda free and doesn’t cause me discomfort even after days of repeat use. CONs: It’s expensive but since it works, the price is worth it in my opinion. Plus a tube should last months and months. The website says 2-3 months. The texture of the product is a little harder than others I’ve tried, but I find it still goes on really well and that hardness makes it a little less messy. It’s in a plastic tube. PROs: Smells amazing – like lime candy – and lasts all freakin’ day. CONs: Might be hard to find outside of VT. A little difficult to apply. Warm up the stick under your arm 1st and it will become softer and easier to get on. Primal Pit Paste Jacked Up Jasmine, $11. PROs: Smells awesome, works all day long. Like, even through workouts. I like the stick applicator. CONs: I can’t use every day because my underarms get red and sensitive, boo. Stick applicator works well and is less messy than a jar but you still have to hold it for a few seconds to your skin to warm it up before swiping. PROs: Works really well, nice scents (I’ve tried both and love them both!) and the formula doesn’t cause me irritation for some reason. Some days I layered it with a different deodorant though. CONs: The only reasons this isn’t highter on this list is the really messy application even (or perhaps more so) with the stick, and really really pricey. PROs: Smells OH SO fruity and fresh. Works well most days. You can find it at many stores. CONs: Sometimes doesn’t last all day, depending on my workout, etc. I keep it in my gym bag to reapply. Might repurchase. PROs: Really nice formula, goes on very smoothly. Very little “drying time” so good for rushed mornings. Scent was light and nice – lasted most of the day. I keep a travel size of this in my purse because I like that it has a light pleasing scent. Because it’s easy to apply, it’s easy to apply on the go. CONs: I definitely had to reapply during certain days. The scent “mixed” with my sweat smell (sorry, I know, probably TMI) but it wasn’t awful. In other words, I definitely had some of my “natural” smell come through on some days, but it didn’t bother me. It might bother some people who only want to smell deodorant or no odor at all. Might repurchase. Ursa Major, Hoppin’ Fresh, $18. PROs: This stuff is really great. Smells nice and is gentle for anyone with sensitive skin. CONs: You’ll definitely need to reapply during the day. It’s pricey. Won’t repurchase. PROs: I just love the pineapple-sugar smell. CONs: It’s a little “wet” when applied so I like to let it dry with my shirt off. It only lasts at full-strength for 3-4+ hours, yikes! So I only wear it on days I know I won’t be very active (aka lazy Saturday.) Won’t repurchase. PROs: Points for an awesome brand name. Good texture for application + I like the light forest scent. CONs: It just doesn’t last very long, at all. Won’t repurchase. …Have other recommendations? Share in the comments! You can also make natural deodorant yourself if you’re the uber-crafty type. Try the recipe from Organic Beauty Talk or this one from YouTuber Holistic Habits. Stop reading any further if you get grossed out… Seriously, stop. Just to make sure I wasn’t just experiencing the placebo effect, I went a day without any deodorant at all. It was a pretty typical day for me (type-type-type-type-eat good food-type-play-with-my-dogs-type-type) but I didn’t go to the gym. And at the end of the day (actually it was like 1 p.m.), I was stinky. Like, I couldn’t stand to be around myself stinky. So I guess I proved that these all-natural guys really do work, since without them I am a gross mess. Thanks for the suggestions, Ava! I cringe even thinking about Triclosan. I use the Tom’s Apricot and love it. Yes, I sometimes need to reapply but it doesn’t gives me hives and smells nice. Thanks for the comment, Amy! I got a compliment on my “perfume” the last time I wore the Tom’s Apricot and I was almost gleeful to tell them it was my deodorant, hehe. I just came across your site, have you ever tried the natural deodorant Green Body? I have recently started to detox the things I use on my body, switching over to natural products. Do you have recommendations for make-up, hair products, nail polish, etc. In advance, thanks for any light you can impart. Thanks for visiting! I’ll check out Green Body – I’ve never heard of that brand. Switching to all natural products can be overwhelming, but the best advice I can give is start slow and do your “homework.” It can be easy to get “duped” by products that seem less toxic but are really just clever packaging and marketing 😉 I usually visit the Environmental Working Group’s Skin Deep site before purchasing anything. They give a rating to products and an explanation of ingredients. Good luck and congrats on your decision to go natural! Arm and Hammer has an essentials deodorant with no parabans or aluminum. It works for me but I’m not near it to see if it contains triclosan.